—Sardinia has one of the highest rates of centenarians in the world: (22 centenarians per 100,000 inhabitants). In simplified form, this is a time-line of Sardinian history. Before 6000 BC—some traces of human habitation. 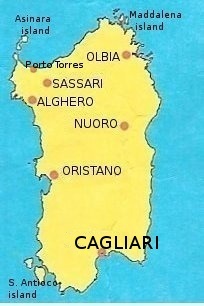 After 6000 BC— Humans settle in Gallura and northern Sardinia. 4th centuty BC—presence of the Ozieri culture, late Neolithic and Copper Age communities in the north of Sardinia. Their implements, caves dwellings and rock-cut tombs are well-known in archaeology. 1800 BC— The beginning of the Nuraghic civilization, the builders of the still iconic structures found throughout the island. 1000 BC— The Phoenicians start to colonize the island. 500 BC—The Carthaginians conquer and replace the Phoenicians as the main settlers on the island. 238 BC—The Carthaginians surrender the island to the Romans. 456 AD—The end of the Roman occupation of Sardinia. 456-534 AD—The island is subjected to raids by the Vandals. 534-710 AD—Sardinia is ruled by the Byzantine empire. 700-900—The island is subjected to increasing raids by Saracens and native inhabitants largely desert the coasts for the rugged interior. 900-1400—An independent Sardinia is ruled by a loose collection of judicatures. 1297—Sardinia briefly forms part of the regnum Sardiniae et Corsicae ("kingdom of Sardinia and Corsica"), a largely fictitious entity proclaimed by Pope Boniface VIII that was meant to be a gift by the Pope to James II, King of Aragon. 1400-1497—The island is taken over by the Aragonese and forms part of the co-called “Crown of Aragon,” a confederation of sea-faring entities owing allegiance to the king of Aragon. 1497—With the formation of the nation state of Spain (through the union of the Castillian and Aragonese dynasties), Sardinian becomes part of the Spanish Empire. 1700—The break-up of the Spanish Empire cause the Wars of the Spanish Succession, as a result of which Sardinia passes to Austrian rule (as part of the now Austrian vice-realm of Naples). 1718—The Treaty of London gives Sardinia to the Italian house of Savoy, whose domain had been limited to the Piedmont in Northwestern Italy. With that, the Kingdom of Piedmont-Sardinia is born, the nucleus of the modern nation state of Italy. 1814—After the Napoleonic Wars, the Congress of Vienna joins Piedmont-Sardinia with the Kingdom of Liguria (the capital of which is Genoa). 1861—After the conquest of the Kingdom of the Two Sicilies (Naples) by Garibaldi, Victor Emmanuel II , the king of Piedmont-Sardinia proclaims the new nation of Italy, including Sardinia, and becomes the first King of Italy. 1948—Sardinia becomes one of the five special autonomous regions of Italy. This means that while the Italian constitution is the law of the land, a special statute of automy grants administrative powers to these regions, powers that the other regions of Italy do not possess.